Celeste lives in Valaparaíso Chile. This is her home, where she belongs, and yet soon, it is no longer safe for her to stay. The democratically elected president has been murdered, and a dictator has arisen in his place. Celeste's parents are both doctors who give free services to the poor. Since they seek economic quality and supported the president, they are seen as subversives. They go into hiding and Celeste goes to live with her aunt in Maine. She will return to Chile two years later at the death of the dictator. This is a book about place and belonging. I'm fascinated by Chile which is what caught my attention about the book. What stands out most about Agosín's description of Chile is its blueness. It is also a book about following your intuition. This element almost verges on magic realism, with one of Celeste's friends, Cristóbal , reading the truth with a pendant he carries with him everywhere. Celeste must rely on her intuition when goes to search for her father who is still in hiding. One aspect I found really jarring about reading this is that Agosín chose to give President Allende, whom this story is modeled after, a fictional name and refers to Pinochet only as the "Dictator." I found this distracting and confusing. What was her reason for doing it? Was it so that the story would have to stand on its own merit with less historical veracity? 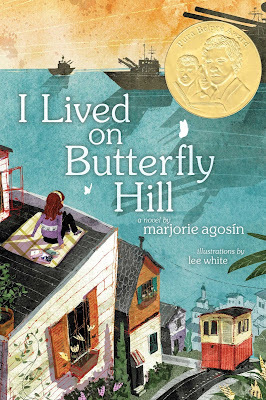 The author did live in Chile when she was younger and moved to the United States, so it's at least semi-autobiographical. Was she trying to gain some distance from her own experiences as opposed to the character's? Maybe it was so she could collapse the fifteen years of Pinochet's dictatorship into two years. In general, though, I enjoyed it. Celeste has the same courageous, humanitarian spirit as her parents. Almost all the characters in the book come across as people with whom I would enjoy interacting. Something I learned to do-- it's very difficult and took a long time-- is to braid my own voice into the silence of day and of night. The silences when the sky is dark and when it is light are distinct. I learned that, too. And I learned to speak to them both.